Every April, Delaware County’s mentoring program for young mothers, Moms Offering Mentoring Support (MOMS), holds a baby shower for participants of the program. Pictured, left to right, are Shannon Price, Ashley McWherter and Tori Trejo. 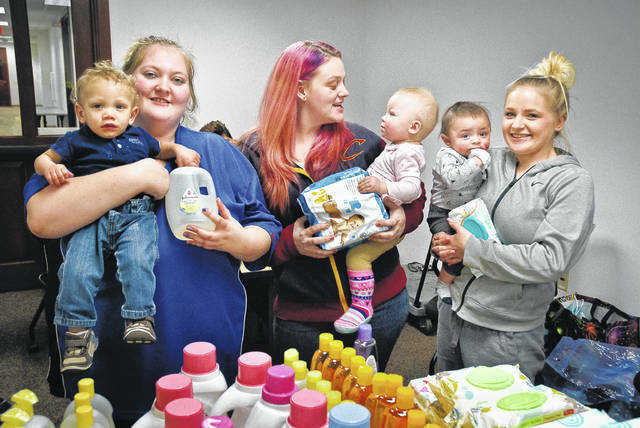 On Thursday, all three moms received bottles of baby shampoo, containers of baby wipes, diapers, baby oil, laundry detergent, and a dinner to celebrate the birth of their babies. Delaware County’s mentoring program for young mothers, Moms Offering Mentoring Support (MOMS), held a baby shower Thursday for the program’s new and soon-to-be mothers. Dillman pointed out three mothers who had recently given birth in the last year and said that 50 people had shown up to celebrate with the three new moms. The MOMS program matches experienced mothers with young moms to help teach the new mothers how to care for children, connect with community agencies, and help them to develop life-coping skills. The program is sponsored by the Delaware County Juvenile Court. Cram said she started the program in November 2004, and by January of 2005, received the first grant to help fund the program. She said for the last 13 years she has been receiving grants from different sources to support the program. However, “In the past year, the juvenile court has been paying most of the funding for the program,” she said. Cram added the program started for teen moms, but there is no age requirement nor is there a limit on gender because the group accepts fathers as well. Cram said the group will have speakers come in to talk to the young parents. She said that she’ll ask the Delaware County Health District to come and speak about smoking or have Job and Family Services (JFS) attend to talk about the services it offers to young families. Cram said next month the group is touring a fire station. She added in June, MOMS will have its big family picnic in the park. Many of the parents who now participate in the program were once children themselves when their parents participated in the program. One mother now in the program, Cram said, she has known since she was a 10-year-old. Dillman said the gifts for the baby shower — diapers, baby oil, baby shampoo, laundry detergent and a dinner — were donated by Gina Grote, Erika Panosky, Kathy Terry, Kim Carroll, Sheryl Johnson and Meg Cook. “It’s just a special time, and we’re grateful for them,” she said. This entry was tagged Cram, D. Anthony Botkin, delaware county, Dillman, mentoring program for young mothers, MOMS, Moms Offering Mentoring Support. Bookmark the permalink.